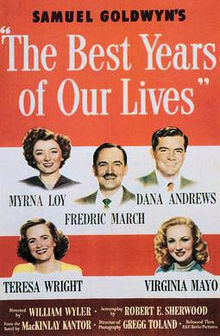 One of my favorite movies is “The Best Years of Our Lives.” Released in 1946, it’s not about the fighting during World War II. Instead the movie tells the story of three servicemen returning to their hometown after the war. The three main characters are very different yet their journey home together forms a bond between them. Captain Fred Derry, played by Dana Andrews, was a poor kid who worked as a soda jerk before the war. 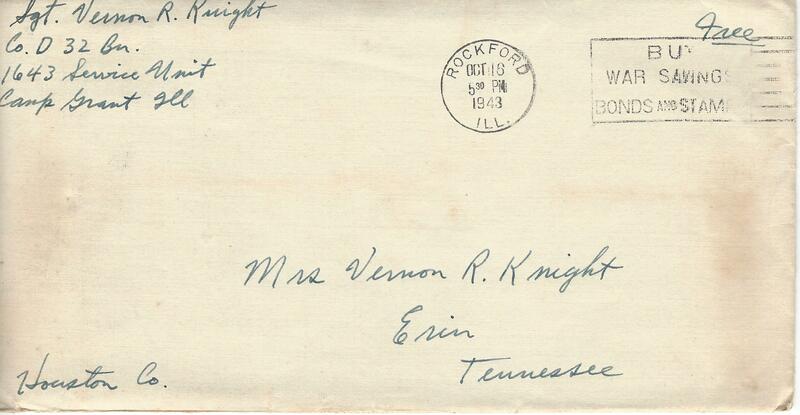 In the Army Air Corp he rose to the rank of Captain and served as a bombardier on a B-17. While in uniform, he married a pretty blonde (Virginia Mayo) who went to work in a night club after he left and had a high old time while he was away. She still wants to party with her handsome, uniformed soldier while Fred wants to settle down and find a job. Unfortunately he’s not qualified for most civilian positions and can’t compete in a market flooded with returning GI’s. Sergeant Al Stephenson, played by Fredric March, was an up-and-coming banker until Uncle Sam put him in the Army. 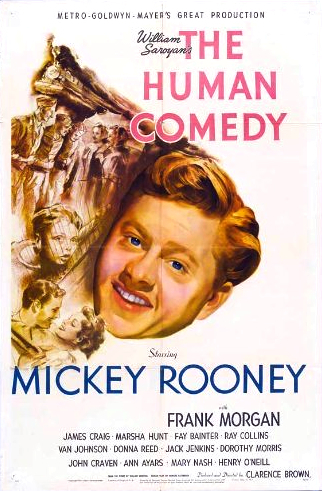 When her returns he barely knows his wife (Myrna Loy), his grown-up daughter (Teresa Wright) and his teenage son. The children have grown up while he was gone. He reluctantly returns to the bank with a new attitude about what is important. The third serviceman is the young sailor Homer Parrish, played by real injured veteran Harold Russell. Homer, who had been a high school football player, lost his hands in a naval battle. He has learned to use the hooks the Navy gave him and dislikes being treated like an invalid. The pretty girl-next-door waited for him and still wants to marry him but Homer doesn’t want to burden her with his disability. Hoagy Carmichael, as Homer’s Uncle Butch, adds color to the story by playing piano in his bar where the three men meet up. 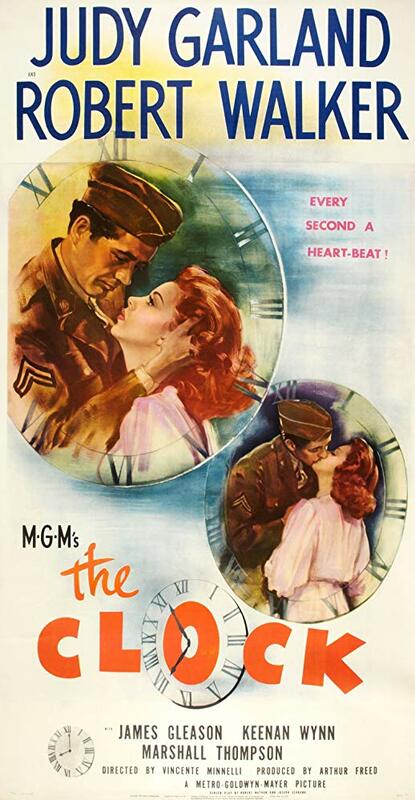 The movie trailer for “The Best Days of Our Lives” bills it as full of romance. There’s Homer and his girlfriend who resolve their differences and get married. The middle-aged couple, Al and Milly, become reacquainted and fall in love all over again. And the main romance between Fred and Al’s daughter, Peggy. Attracted to Fred, she sees that his wife doesn’t really care about him, so she decides to break up the marriage. Fred finally sees his wife for the gold digger she is. He cares for Peggy but without a job he has nothing to offer her. 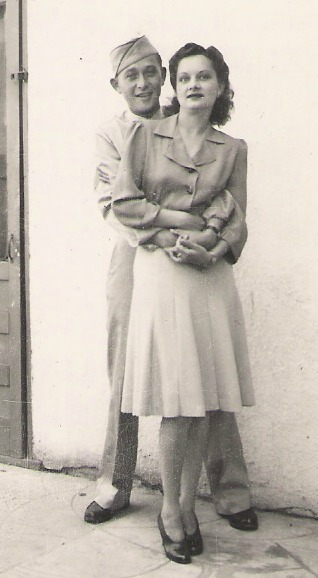 But don’t worry, there is a happy ending for Fred and Peggy, too. You’ll have to watch the movie for the tear-jerker ending. One of the most visually impressive scenes in the movie shows acres and acres of airplanes, both bombers and fighters, waiting to be demolished and recycled. The sweeping scene is like viewing a vast military cemetery and remembering the former glory of those buried there. All my research on the 8th Air Force makes this an emotional scene for me.